It is beneficial for animals to live in groups rather than in single housing. Many behavioural diagnostic tests, however, require an individual animal to be alone while tested. Traditionally, this requires manually placing an animal from a home cage to the test arena and back. With the IDsorter connecting the home cage with a test arena, this process is fully automated. Our system can be interfaced to operant systems from other vendors or to video observation systems. The IDsorter is based on RFID-technology. 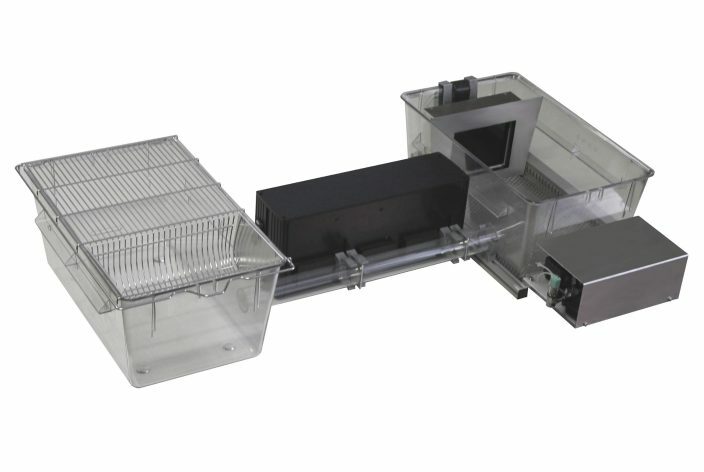 It allows the selective passage of a single animal to the test arena and back, while individual experiments can be conducted in the operant chamber with independent experimental control software. Radio-frequency identification (RFID) technology identifies and tracks an individual within a group of animals. All animals need to carry subcutaneous transponders. These transponders require no battery and are powered by the electro-magnetic fields emitted by the RFID-Readers. “An automated, experimenter-free method for the standardised, operant cognitive testing of rats.” PloS one, 12(1), e0169476. An animal is detected at RFID-Reader 1. If the experimental protocol gives permission, gate 1 opens. The animal is detected at RFID-Reader 3. Gate 1 closes when it is safe for the animal. Gates 1 and 2 remain closed for 30s. After 30s, gate 2 opens. The animal can enter the operant compartment. Gate 2 can close if the animal is registered within the test arena or remain open. 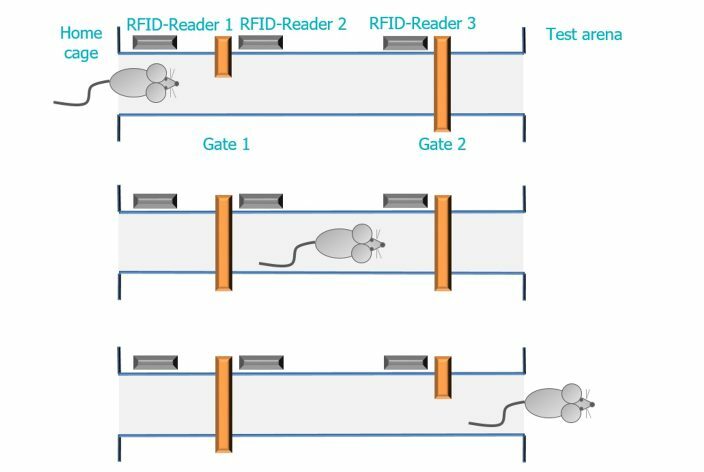 If the animal is detected at RFID-Reader 2 or 3 Gate 2 will close and Gate 1 open to release the animal to the group cage. Can be combined with our Touchscreen Chamber. 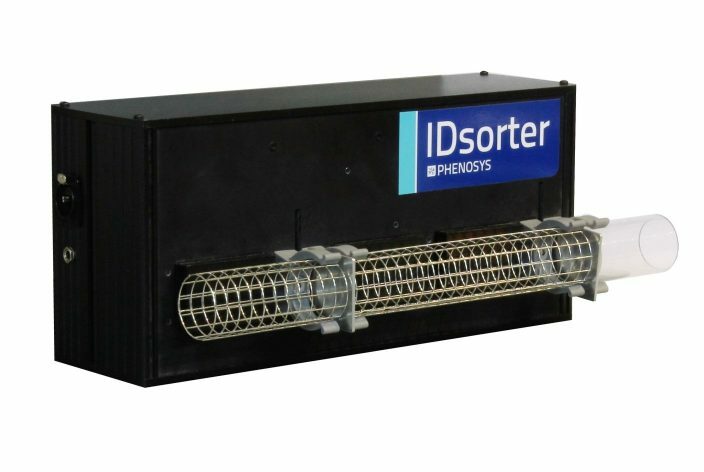 IDsorter with 3 transponder readers and double-door system. A balance is optional. Touchscreen Chamber (custom version) in combination with the IDsorter and home cage for full automation. 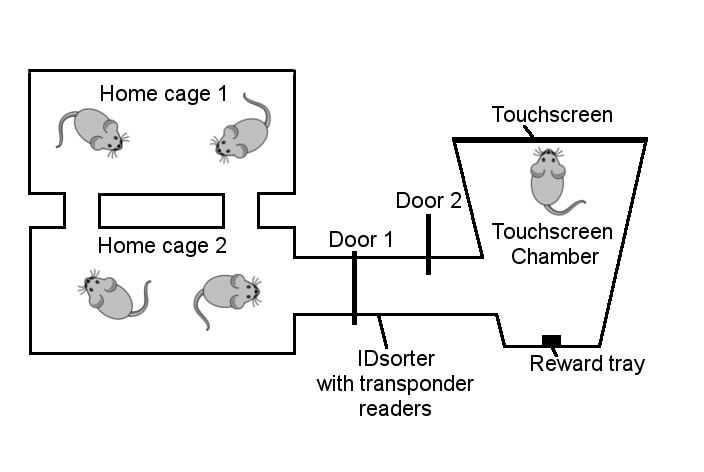 Schematic of an automated Touchscreen Chamber setup combination with home cages. The IDsorter is used to grant or deny access of particular animals according to the pre-programmed experiental schedule.